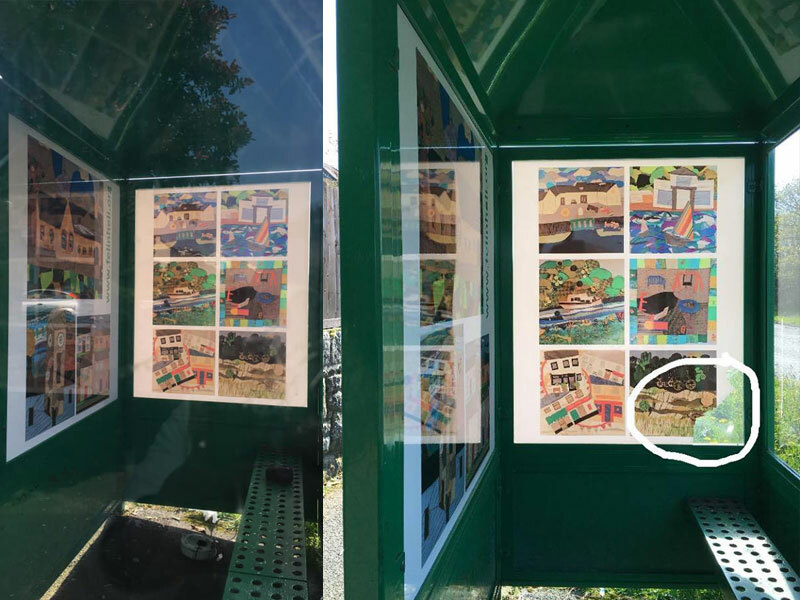 Some of the bus shelters around the village have been vandalised over time, so the community Council though that it would be a great idea to do a refurb to them with the children’s art work from the school as a trail run. The first bus stop we focused on was the bus stop near the Church. Once the at work went up it was looking great but after only a few hours it had been vandalised! How sad. Please contact the police on 101 and give the case number X048273 should you have any information. 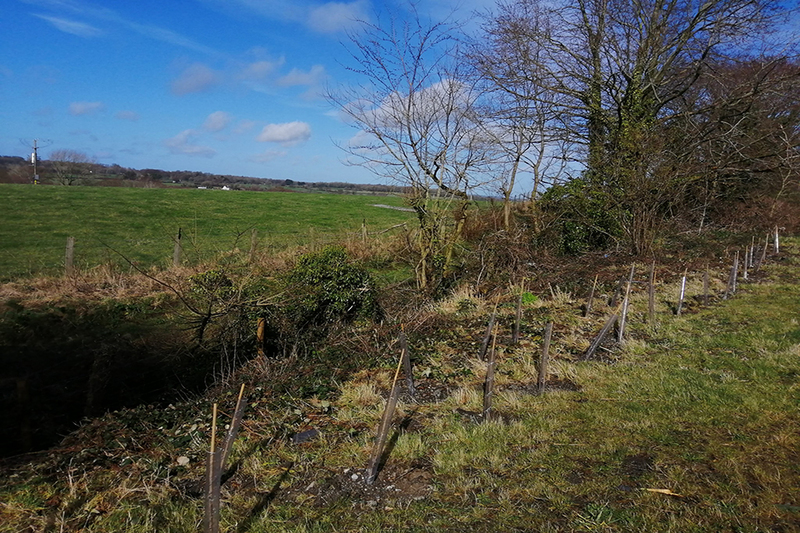 Thanks to those who give their time to help keep Felin tidy on Sunday 07/04/19, 37 bags picked up and the village looks much tidier! Applications invited for the above post. 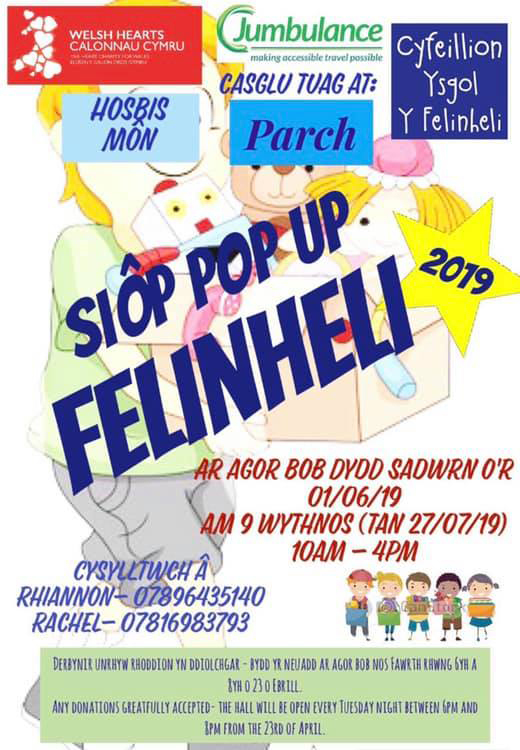 Contact the Clerc to Cyngor Cymuned Y Felinheli Community Council for more information: clercfelinheli@aol.com. Or by phoning 07867 982518. Applications by CV to the Clerk to the Council. An year hasd passed since fruit trees and new hedges were planted opposite Cerrig yr afon. We are going tobuild a bug hotel for the insects that will visit the wildflowers and fruit trees. Come and help! Thanks to Bob Griffiths for planting a new hedge instead of the plants that were destroyed last year. 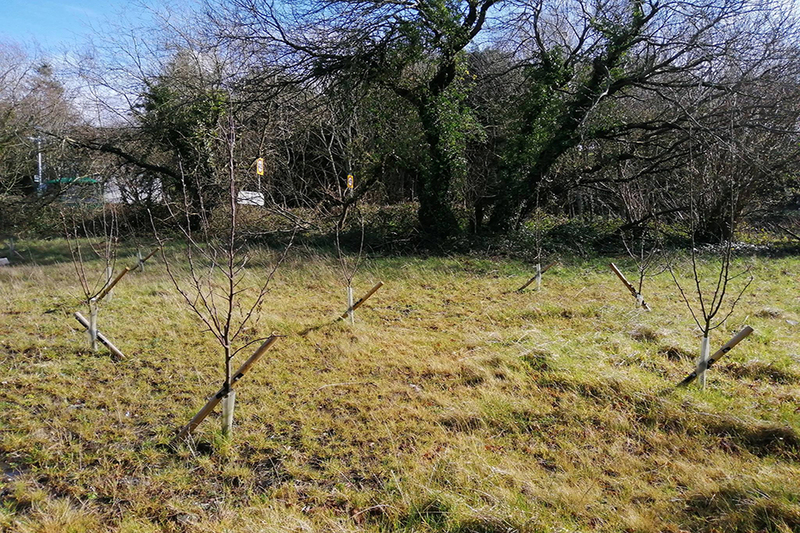 The fruit trees we planted on the Lôn Las almost an year ago are looking healthy! 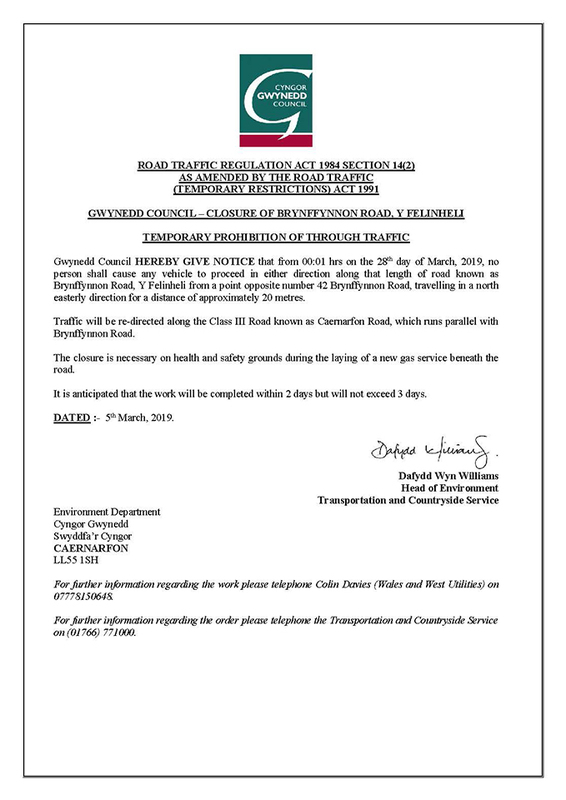 Notice - Closure of Brynffynnon Road, Y Felinheli from 00:01 hrs on the 28th of March 2019. Work will be completed within 2 days but will not exceed 3 days. 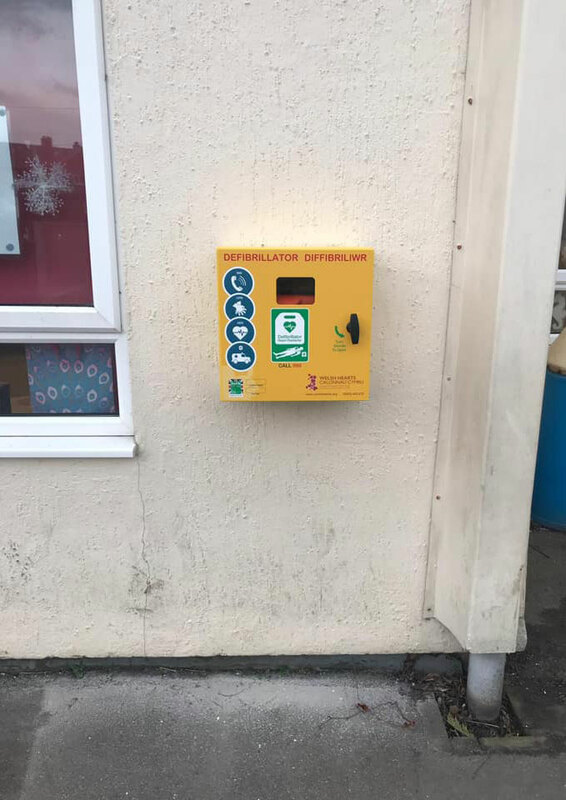 New Defib up in the school. Grow Wild youth projects provide young people aged 14-25 with £500 funding to do something creative and collaborative, inspired by UK native plants and fungi. Over 150 young people have led projects so far. 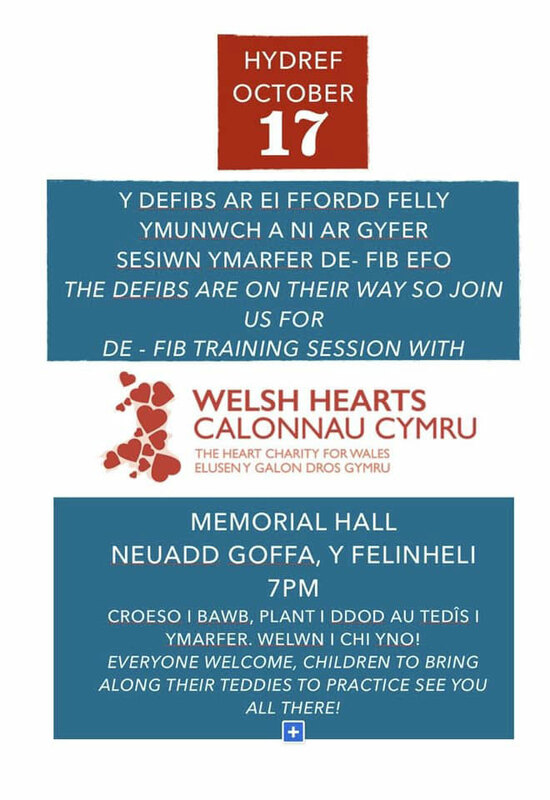 Any youth in Felinheli interested? Grow Wild funding can help young people to improve their CV or personal statement, make connections with their community, develop new skills and help raise awareness of nature. Grow Wild youth projects provide young people aged 14-25 with £500 funding to do something creative and collaborative, inspired by UK native plants and fungi. Over 150 young people have led projects so far.Grow Wild funding can help young people to improve their CV or personal statement, make connections with their community, develop new skills and help raise awareness of nature. 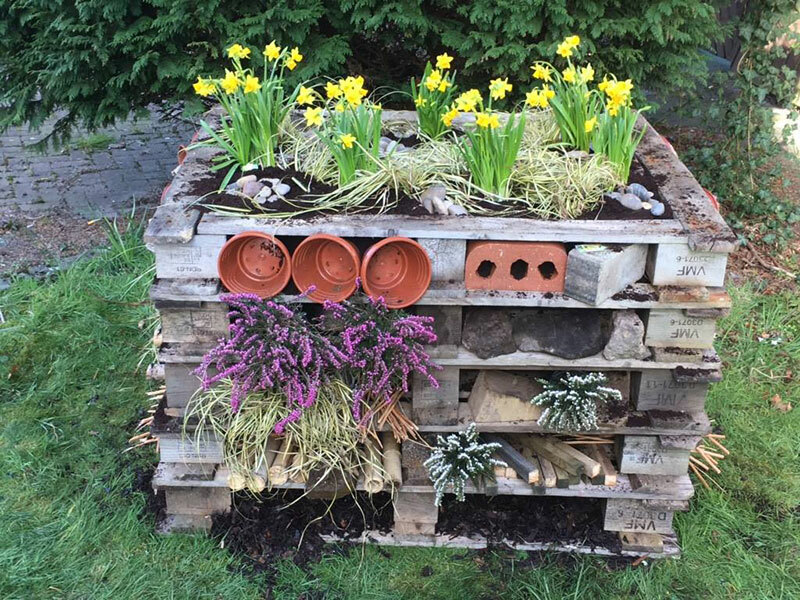 Grow Wild youth projects provide young people aged 14-25 with £500 funding to do something creative and collaborative, inspired by UK native plants and fungi. Over 150 young people have led projects so far. Gall ariannu Tyfu’n Wyllt helpu pobl ifanc i wella eu CV neu eu datganiad personol, creu cysylltiadau gyda’u cymuned, datblygu sgiliau newydd a helpu i gynyddu ymwybyddiaeth am natur. 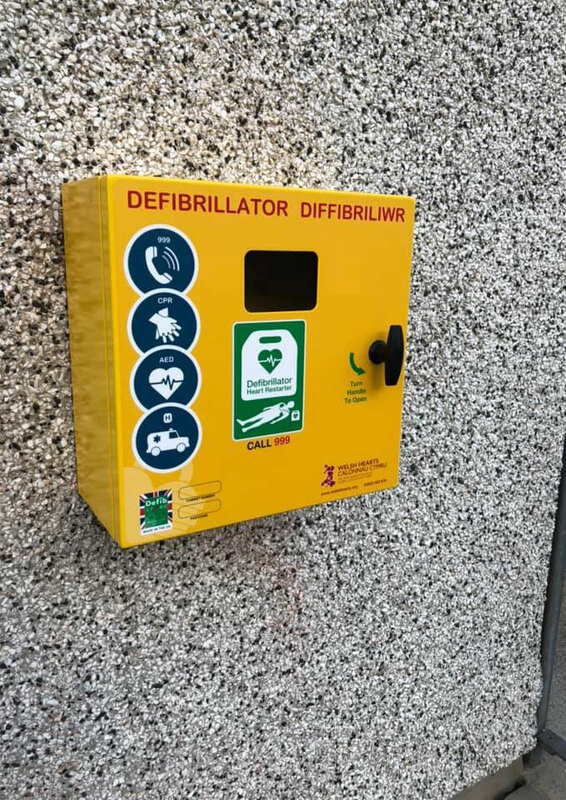 Defib are in place at Y Felinheli Football Club. 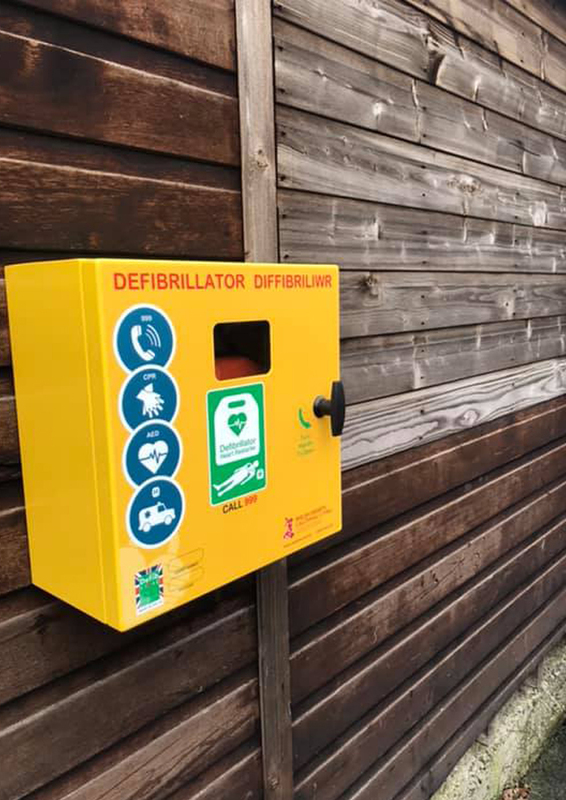 Our first Defib for the village on the Memorial Hall! 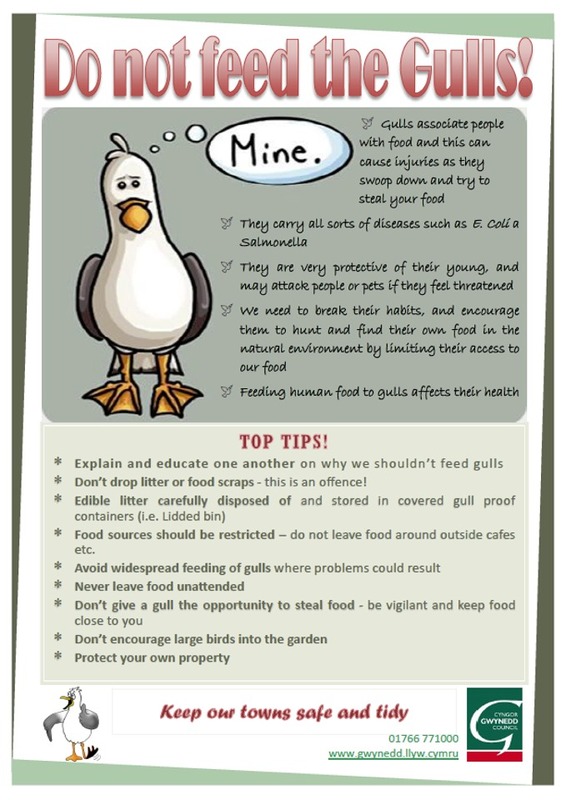 14/01/2019 - Do not feed the Gulls! The Community Council are receiving applications for grant. You can down load an application. Closing date 31 January 2019. 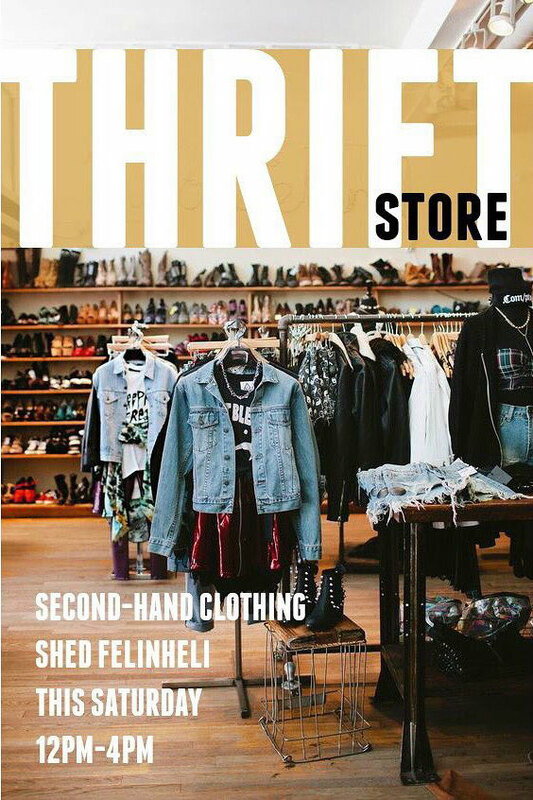 Second-hand clothing and home wares for sale in @shed_cymru Thrift Store this Saturday! 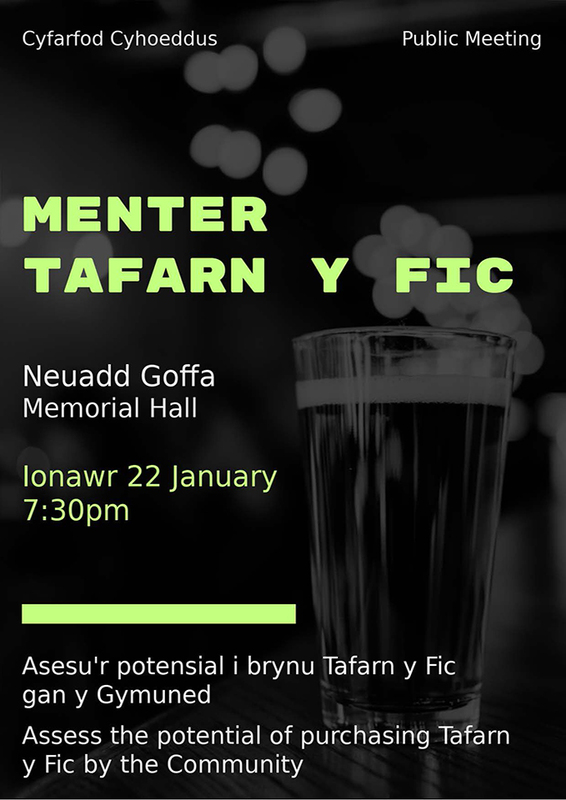 Caretaker Y Felinheli Memorial Hall. 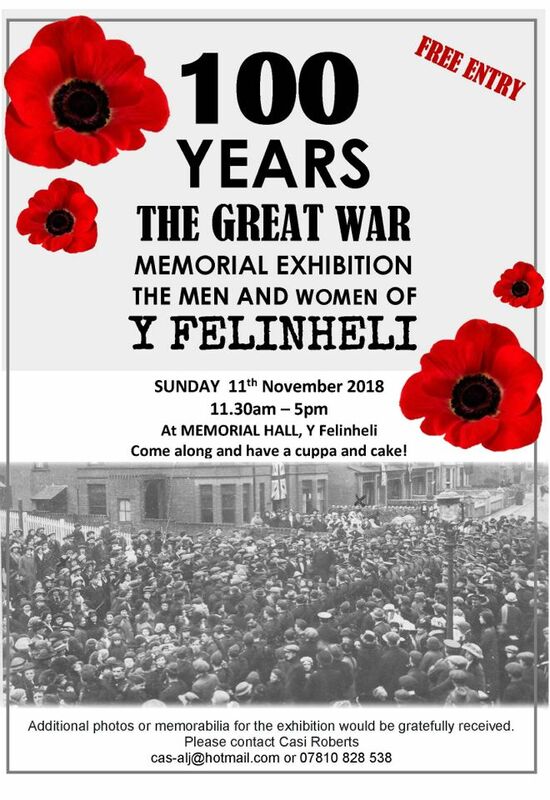 Sunday 11th November 2018, 11.30am - 5pm. Remember about the training night next Wednesday! 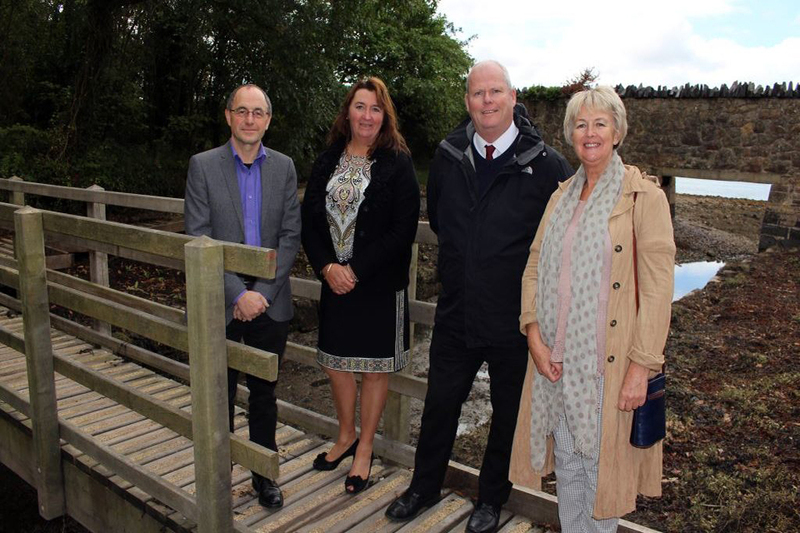 A new section of the coastal path has opened which connects the village of Felinheli with the Glan Faenol estate in Bangor, following upgrading work by Gwynedd Council. 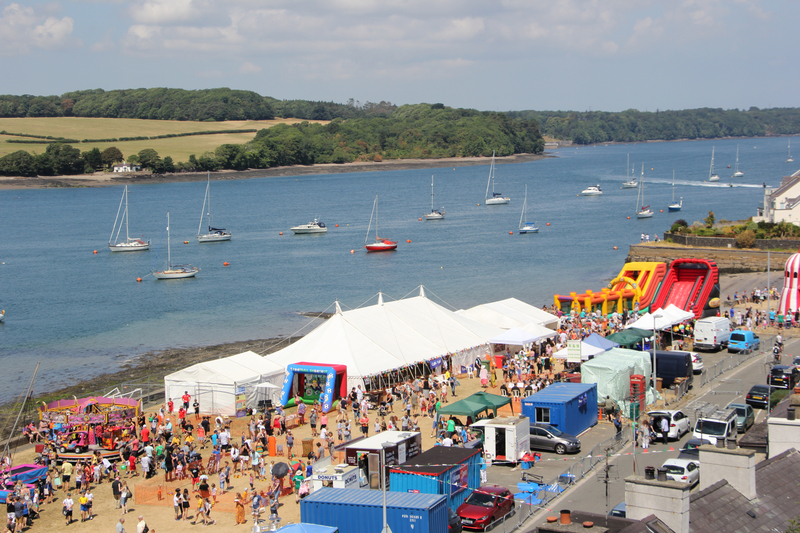 Clip of Councillor Gareth Griffiths and the new coastal path. 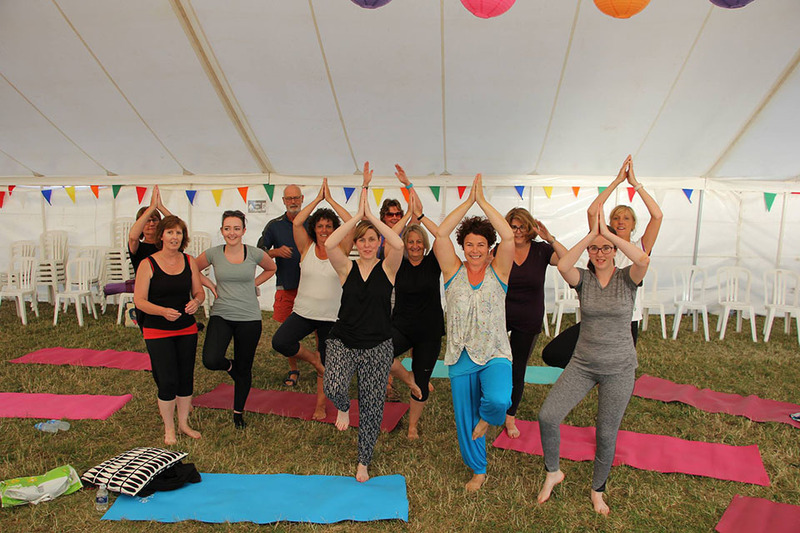 Who was at the Yoga in this year's festival? Saturday, 28/7/18 - 10am - 4pm. causes in village and of course the De-fibs dotted around the village. Thank you to everyone who came and gave us a visit during Gwyl Y Felin. Thank you for your feedback, the council will be reviewing them in the coming weeks. We collected 14 bags of rubbish and one-wheel trim between everyone, all in one and a half hours - great work. One crew started in Griffiths Crossing and went along the Lon Las towards the village with a detour down to Llanfairisgaer. The second crew collected rubbish along the street and then down to the beach. The third crew went along the Lon Las towards Silo and back along the road. 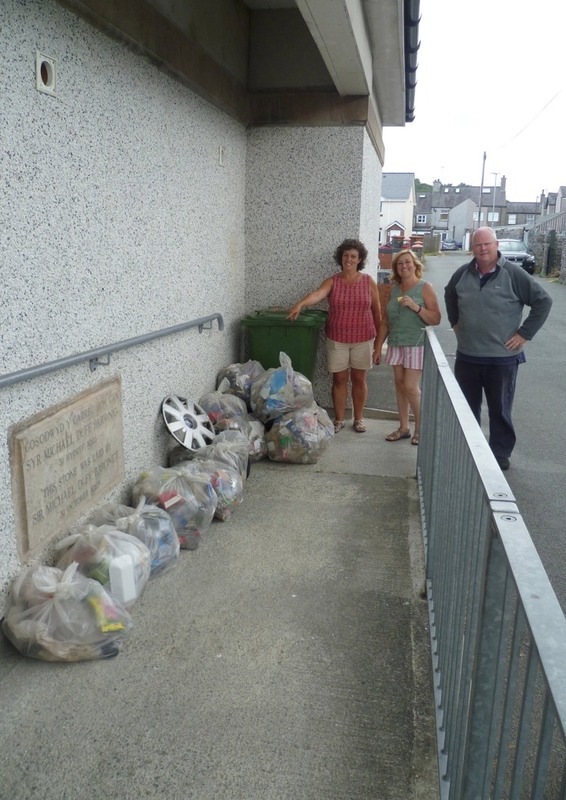 This group had collected rubbish on their way down to the hall before arriving along Caernarfon Road. The final crew cleared around Rowen field and the nearby lanes. There are many places with a lot of litter found. Behind the bus stop near the church. Behind the bus stop near Cerrig Yr Afon. On the grass verges from Cerrig yr Afon to Caernarfon. We’ll tackle them next time. Thanks to Councilor Daniel for arranging the pick. 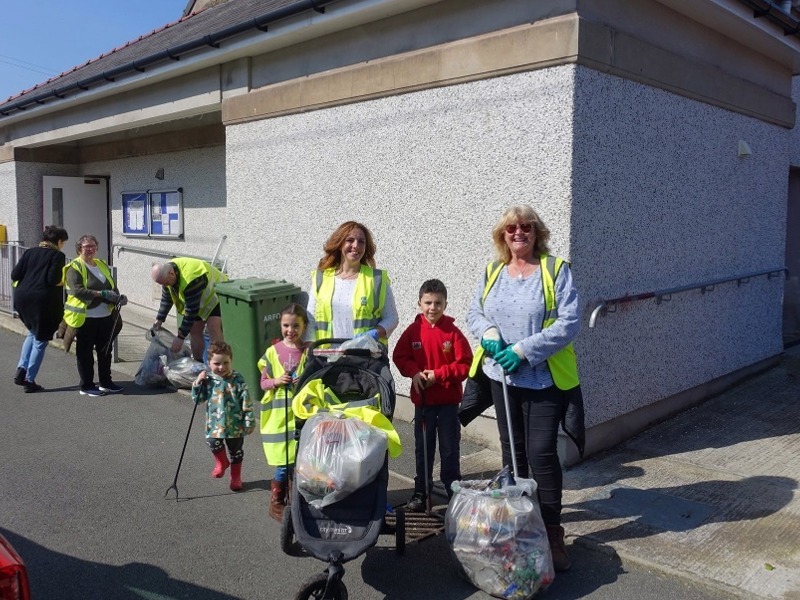 Next litter pick will be on the 27/07/18 at 11am start at the Memorial Hall. Tea, Coffee and biscuits afterwards. 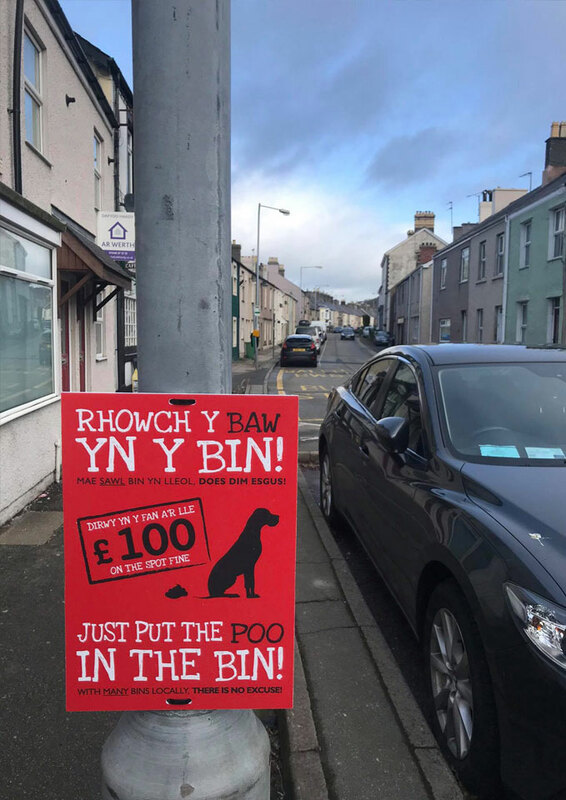 The way of complaining to Gwynedd Council or applying for a service to Gwynedd Council has changed recently. You can do this through their website. 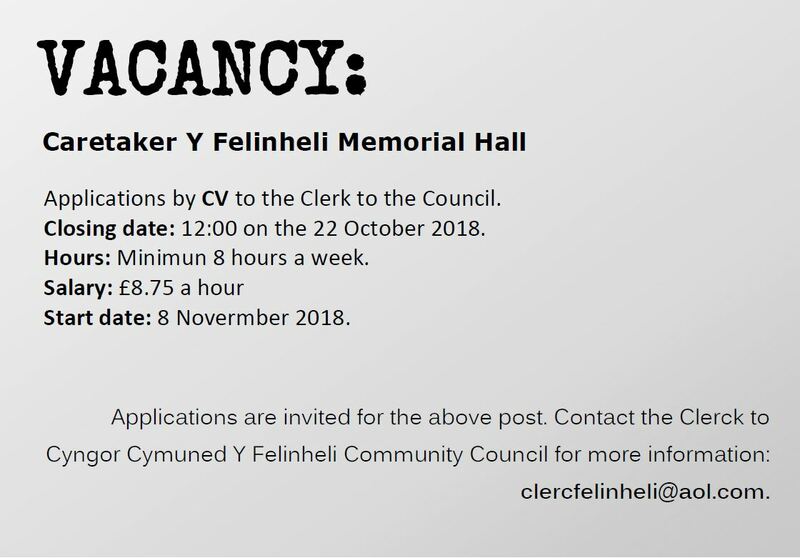 NOTICE IS HEREBY GIVEN of 2 casual vacancies in the office of councillor on Y Felinheli Community Council. An election will be held to fill the two vacancies if a request in writing for an election by ten electors of the said community is sent to the Returning Officer, Gwynedd Council, Council Offices, Caernarfon, Gwynedd LL55 1SH within the period ending at 12 noon on Monday 4 June , 2018. In the absence of a request for an election, the vacancies will be filled by the Community Council. 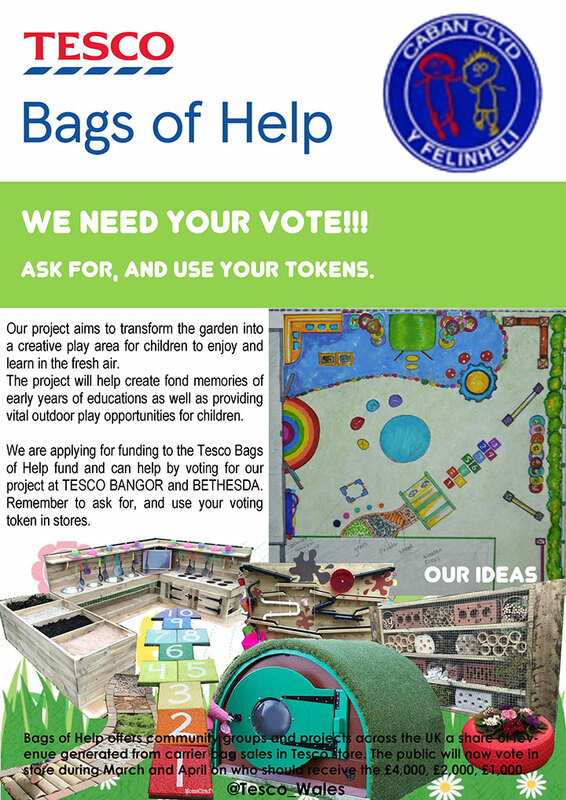 06/03/2018 - We Need Your Vote! I have been walking the Ward and will continue to do so over the next few weeks. I have reported matters brought to my attention. Galw Gwynedd - the Council’s call centre 01766 771000. [a] Met with the Gwynedd and Mon Youth Justice Services Team. [b] Meetings as a Member of the Cabinet.And various meetings as a Councillor. I continue to work on behalf of individuals in the village. [a] Ysgol Syr Hugh Owen School as School Governor. 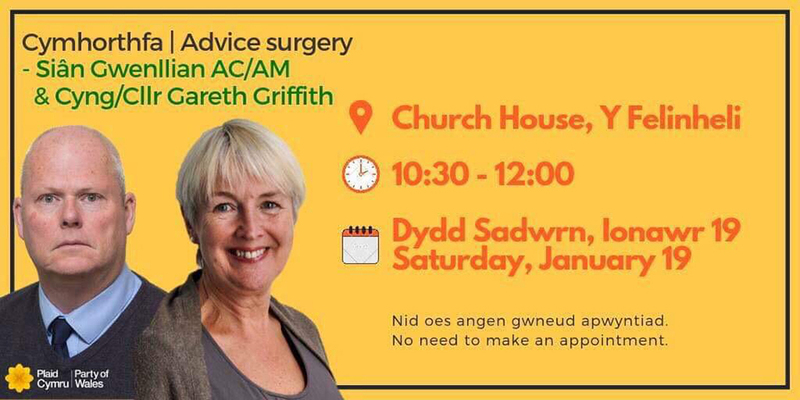 [b] Plaid Cymru Group and Electorate Meetings. [c] I visited Parc Adfer – a residual waste management site[under construction] on Deeside. 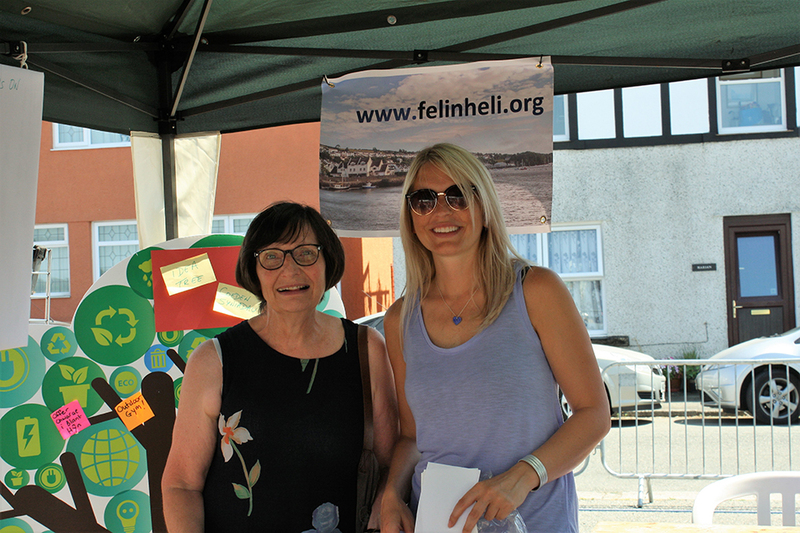 [d] Attended the Felinheli Festival Committee. [e] Continous Training for Councillors. 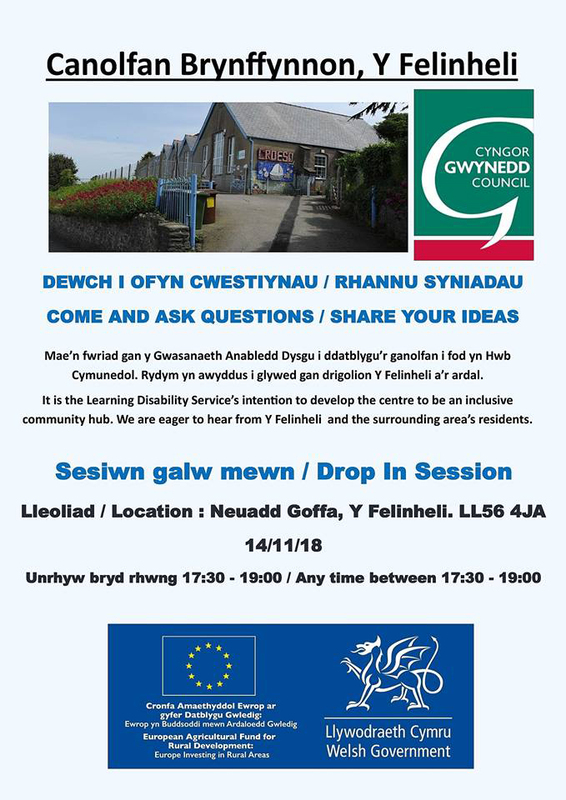 [f] Meetings at Gwynedd Council. I am trying to obtain contact details of the numerous groups in the village. Can you please send me your details’. I want the information so that I can contact you in the event that grants are available and so forth. The work to repair the Afon Heulyn path has been completed. The path is now open. 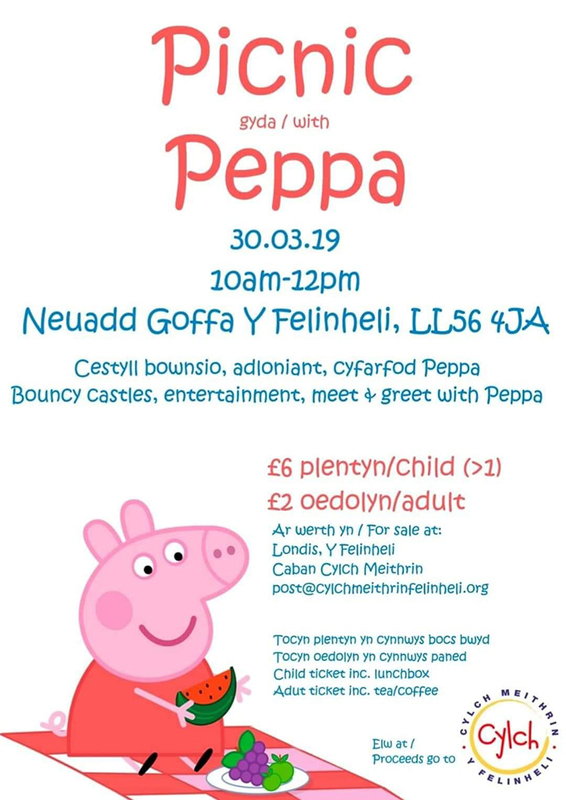 [a] Felinheli Primary School as School Governor. [b] Plaid Cymru Group Meetings. 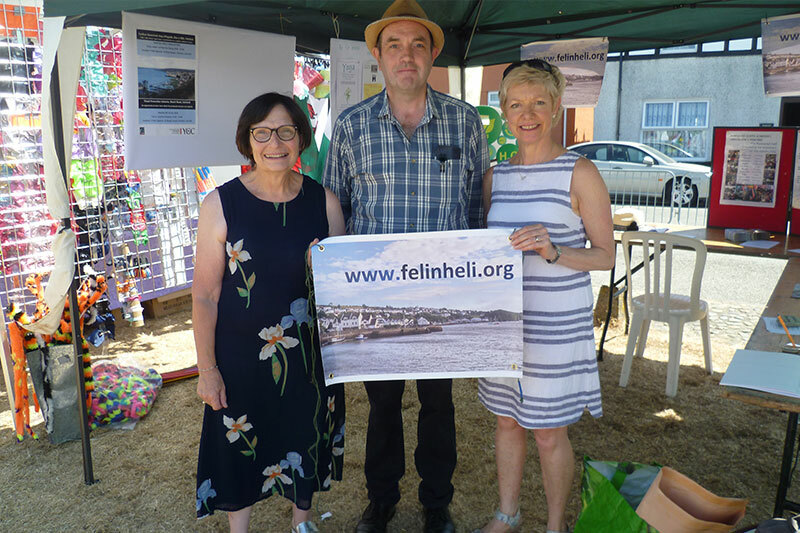 [c] Felinheli Community Council Monthly meeting..
[d] Attended the Felinheli Festival Committee. 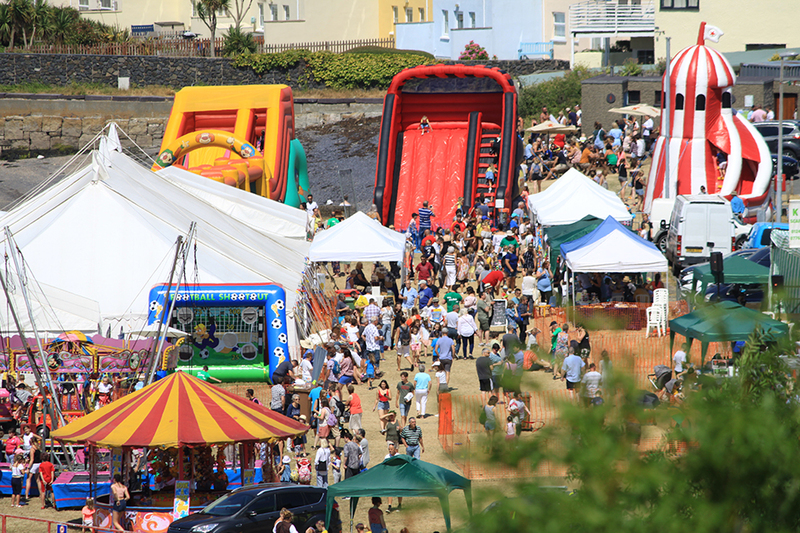 The Festival has taken place and was a success. [e] IT training for Councillors. [g] I spoke on behalf of Rowen and Dinas residents against a planning appeal to build on the land below the medical centre. [h] I attended the Shed, a new business venture in the village. Good look to them. I am trying to obtain contact details of the numerous groups in the village. Can you please send me your details’. I want the information so that I can contact you in the event that grants are available and so forth. I have not received any response to this request. The work to repair the Afon Heulyn path is due to start.